The Universal Declaration of Human Rights (abbreviated UDHR) is a foundational document of modern international human rights law. It was adopted by the United Nations General Assembly December 10, 1948, at Palais de Chaillot, Paris. It consists of 30 articles which outline the standards of the United Nations on the human rights guaranteed to all people. Although the Declaration is non-binding, it has proved influential since its passage and many of its articles have been adopted into important international treaties as well as constitutions of nations. Numerous Non-Governmental organizations (NGOs), have arisen dedicated to one or more articles listed in the Declaration. Eleanor Roosevelt, first chairperson of the Commission on Human Rights (CHR), which drafted the Declaration, said, "It is not a treaty...It may well become the international Magna Carta..."
The Declaration guarantees many important and fundamental human rights such as freedom of speech, press, assembly, religion, and the rule of law, as well as the right to leave one's country, to receive an education, to participate in government, to work, and to a decent standard of living and health care. It also affirms that everyone shall be free from slavery, gender inequality, racial discrimination, and exploitation. However, the Declaration also stipulates that these rights must be exercised according to the "just requirements of morality, public order and the general welfare in a democratic society." The "public order" clause has often been used by authoritarian governments to abrogate some the rights guaranteed in other articles. The new Palais de Chaillot, site of the adoption of the Universal Declaration of Human Rights. Prior to the proclamation of the Universal Declaration of Human Rights, several countries had adopted declarations of human rights. Well known examples include the Bill of Rights in the United States, and the Declaration of the Rights of Man and of the Citizen in France. However, neither of these is as detailed and far-reaching as the UNDR. After the founding of the United Nations and considering the atrocities committed by Nazi Germany during World War II, a consensus within the world community soon emerged that the United Nations Charter did not sufficiently define the rights that it referenced. A universal declaration that specified the rights of individuals was deemed necessary. Canadian human rights expert John Peters Humphrey was called upon by the UN Secretary to work on the project and became the Declaration's principal drafter. Humphrey was assisted by Eleanor Roosevelt of the United States, Jacques Maritain and René Cassin of France, Charles Malik of Lebanon, and P. C. Chang of the Republic of China, among others. To achieve a document acceptable to all parties in the United Nations, however, was no easy task. The philosophy of the United States, rooted in ideas of innate human rights, was offensive to the Soviet Union, which objected to the strong wording of several provisions guaranteeing individual rights. Saudi Arabia objected to the stipulation in Article 18 of the right to change one's religion, as well as to the wording of articles guaranteeing women's rights which it found offensive to Islamic tradition. South Africa could not agree to guarantees of racial equality which flew in the face of its own system of apartheid. Some capitalist countries were concerned about guarantees of economic rights that might conflict with the principles of a free market economy. Nevertheless, the proclamation was ratified during the General Assembly on December 10, 1948, by a vote of 48 in favor, zero against, and eight abstentions (from Soviet Bloc states, South Africa and Saudi Arabia). Securing abstentions from these nations (rather than opposing votes) would have been impossible were it not for the Declaration's non-binding status. However, as a result, the Declaration has been criticized for not having "teeth." Moreover the "public order" clause of Article 29 has often been used by totalitarian states to abrogate the rights guaranteed in other articles. The Guinness Book of Records describes the UDHR as the "Most Translated Document" in the world, having been translated as of 2004 into 321 languages and dialects. The date of the Declaration's adoption, December 10, is now celebrated annually as international Human Rights Day. 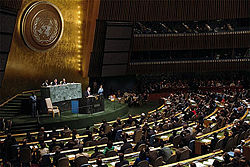 UN General Assembly in New York. The document is laid out in the civil law tradition, including a preamble followed by 30 articles. Articles 3-21 deal with civil and political rights, while Articles 22-27 outline economic, social, and cultural rights. (See text for details.) Although it is non-binding on UN members, the Declaration forms part of customary international law and is a powerful tool in applying diplomatic, political, and moral pressure on governments that violate any of its articles. The 1968, United Nations International Conference on Human Rights decided the UDHR "constitutes an obligation for the members of the international community" to all persons. The declaration has also served as the foundation for several other UN human rights covenants including: the 1965 International Convention on the Elimination of All Forms of Racial Discrimination, the 1966 International Covenant on Civil and Political Rights, the 1979 Convention on the Elimination of All Forms of Discrimination against Women, the 1984 Convention against Torture and Other Cruel, Inhuman and Degrading Treatment and Punishment, the 1989 Convention on the Rights of the Child, and the 1997 International Covenant on Economic, Social and Cultural Rights. The Declaration continues to be widely cited by academics, advocates, and constitutional courts. The wording of several of the Declaration's specific articles was also adopted into the constitutions of several counties. It has also been an important source in the development of the European Union's standards for human rights legislation. Finally, numerous Non-Governmental Organizations have dedicated themselves to one or more of the Declaration's articles. In a speech on October 5, 1995, Pope John Paul II called the UDHR "one of the highest expressions of the human conscience of our time." 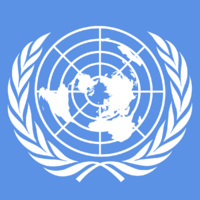 An official statement of the European Union on December 10, 2003, said: "Humanity has made extraordinary progress in the promotion and protection of human rights thanks to the creative force generated by the Universal Declaration of Human Rights, undoubtedly one of the most influential documents in history. It is a remarkable document, full of idealism but also of determination to learn lessons from the past and not to repeat the same mistakes. Most importantly, it placed human rights at the center of the framework of principles and obligations shaping relations within the international community." Marxist-Leninist states often criticized the use of the UDHR to affirm absolutely such rights as freedom of speech, freedom of the press, freedom of religion, and the freedom to leave one's country. In the ideology of the former Soviet Union, these rights must be subordinated to the agenda of the Soviet state to achieve socialism. Today, China, now a member of the UN, routinely affirms that human rights are a matter of its internal affairs and defends its record on civil and political rights on the grounds that its critics, such as the United States, allegedly violate the Declaration's articles guaranteeing freedom from racial discrimination and other social injustices. Predominantly Muslim countries, such as Sudan, Pakistan, Iran, and Saudi Arabia, have criticized the UNDR for its perceived failure to take into account the cultural and religious context of non-Western countries. The rights of women, freedom of speech to criticize Islam, and the right of Muslims to change their religion are particular sticking points for Islamic states. For example, in 1981, the Iranian representative to the United Nations, Said Rajaie-Khorassani, said that the UDHR was "a secular understanding of the Judeo-Christian tradition," which could not be implemented by Muslims without trespassing the Islamic law. The Unites States has sometimes objected to UN attempts to impose its social and cultural "rights" standards on the US. Jeane Kirkpatrick, then U.S. ambassador to UN, argued that certain supposed UDHR economic rights are not true human rights, for they must be provided by others through forceful extraction, Kirkpatrick called this aspect of the Declaration "a letter to Santa Claus," saying, "Neither nature, experience, nor probability informs these lists of 'entitlements', which are subject to no constraints except those of the mind and appetite of their authors." The US has also had objections to UN efforts to define "freedom from torture"—too narrowly in the US view. A widespread criticism of the Declaration is that its non-binding nature makes it a document with no power to enforce its articles. Member states of the UN have routinely disregarded its articles and the UN has often been unwilling or unable to impose meaningful sanctions against the worst violators of the Declaration. The following national documents may be seen as historical precursors to the Universal Declaration of Human Rights. The following international documents may be seen as either directly or indirectly derivative of the UDHR. ↑ Eleanor Roosevelt: Address to the United Nations General Assembly www.americanrhetoric.com, December 9, 1948, in Paris, France. Retrieved May 12, 2007. ↑ "Who are the signatories of the Declaration?" www.unac.org. Retrieved may 14, 2007. ↑ UDHR translation citation under Arts and Media - Books & Magazines www.guinnessworldrecords.com. Retrieved September 13, 2005. However, Guinness also mentions that the Bible has been translated into far more languages and dialects than the UDHR. ↑ David Littman, "Universal Human Rights and Human Rights in Islam," Midstream, February/March 1999. ↑ Capitalism Magazine - United Nations Declaration of Human Rights Destroys Individual Rights Retrieved May 14, 2007. ↑ "What does the New UN Human Rights Approach Bring to the Struggle of the Poor?" www.humaninfo.org. Retrieved May 14, 2007. ↑ "The Substance and Politics of a Human Rights Approach to food and Nutrition Policies and Programmes" www.unsystem.org. Retrieved May 14, 2007. Littman, David. "Universal Human Rights and Human Rights in Islam." Midstream February/March 1999. The Universal Declaration of Human Rights www.un.org. World Conferences on Human Rights and Millennium Declaration www1.umn.edu. Video of Eleanor Roosevelt's Address to UN on the UDHR www.americanrhetoric.com. History of "Universal Declaration of Human Rights"
This page was last modified on 11 January 2016, at 16:24.